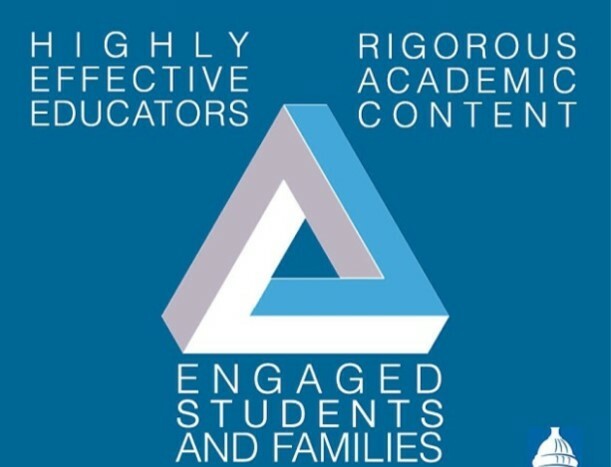 The Cornerstones strategy is designed to use high quality tasks as a lever for change, simultaneously improving student learning and engagement, the quality of teaching, and the depth of academic content. The resources in this section will explain how DCPS used this strategy, and how planners can use DCPS' experience to inform their own change strategy. 1. Ongoing work to develop standards-aligned k-12 curriculum in every content area. Over the past five years, DC Public Schools has built out a robust standards-aligned curriculum across content areas and grade levels. Within units of study, Cornerstones are exemplar learning experiences that include robust teaching resources (lesson plans, student materials). Equitable access to joyful, rigorous, learning experiences: A key goal was to make sure that in every school and classroom, students are thinking, analyzing, and creating while learning standards-aligned content. These should be the experiences students will look forward to in each grade year and remember for years to come. Better professional development: The strategy was designed to support teachers in the thick of their professional work and development, knowing that teachers learn best when they collaborate around the content they are teaching day to day. Coherence and consistency across the system: Given a highly mobile student population, Cornerstones helped DCPS establish a learning trajectory that students will experience at any school in the system. Improvement in content comes through increased rigor through alignment to both the letter and spirit of standards across content areas, and through high quality or “worthy” texts and tasks. Improvement in teacher knowledge and skill comes through professional learning organized around teach-alike cohorts engaged in collaborative planning, teaching, and debrief of tasks and analysis and norming of student work products, as well as through inclusion of resources for building teacher background knowledge. Improvement in student engagement comes through worthy tasks designed to impact students beyond the scope of the Cornerstone experience.